Fellow Svengoolie SvenPals everywhere will be jumping for joy for his coast-to-coast premiere of a classic Columbia Pictures shocker from the master of macabre cinema. The legendary Chicago/Berwyn-based horror/thriller film host will present his big coast-to-coast broadcast premiere of “The Tingler” (1959), this Sat., Nov. 10 at 8 p.m. Eastern/7 p.m. Central on Me-TV. The 1959 Columbia thriller/shocker was directed by veteran director William Castle, who also directed “Macabre” (1958), “House on Haunted Hill” (1959), “Mr. Sardonicus” (1961), “13 Ghosts” (1960) and “The Night Walker” (1964). According to IMDB, Sven aired “The Tingler” (1959) on his hometown station in Chicago/Berwyn, WCIU-TV/”The U” back in Sept. 2008.
Who was in William Castle’s “The Tingler” (1959)? The players who appeared in “The Tingler” (1959) were Vincent Price (as Dr. Warren Chapin), Judith Evelyn (as Mrs. Martha Ryerson Higgins), Darryl Hickman (as David Morris), Patricia Cutts (as Isabel Stevens Chapin), Pamela Lincoln (as Lucy Stevens) and Philip Coolidge (as Oliver “Ollie” Higgins). Original Columbia theatrical prints of “The Tingler” contained an on-screen introduction by William Castle, according to the American Film Institute. That same year, veteran actor Vincent Price appeared in the role of another famous Castle spook thriller, “House on Haunted Hill” (1959, released by Allied Artists; with Carol Ohmart, Richard Long and Elisha Cook Jr.). Darryl Hickman had a long career in acting throughout various film and television productions as a character actor. After the release of “The Tingler,” he married Pamela Lincoln (the two “Tingler” players were married from 1959-82, according to IMDB). Hickman’s real-life younger brother, Dwayne Hickman was known for his title role of Dobie Gillis in the TV adaptation of “The Many Loves of Dobie Gillis” (1959-63, with a young Bob Denver). Five years before appearing in Castle’s Columbia Percepto thriller, Judith Evelyn appeared in Alfred Hitchcock’s Paramount suspense mystery, “Rear Window” (1954, in the role of Miss Lonleyhearts with James Stewart, Grace Kelly, Raymond Burr and Thelma Ritter). First picture filmed in “Percepto!” Original Columbia Pictures theatrical exhibitors’ advertisement for William Castle‘s “The Tingler” (1959). For his 1959 thriller, Columbia Pictures and William Castle purchased surplus World War II motors to be attached under certain theater seats (according to additional details from the AFI database article). Controlled by theater projectionists, the wired motors would give certain theatergoers a surprising mild “jolt” during key scenes in the film. 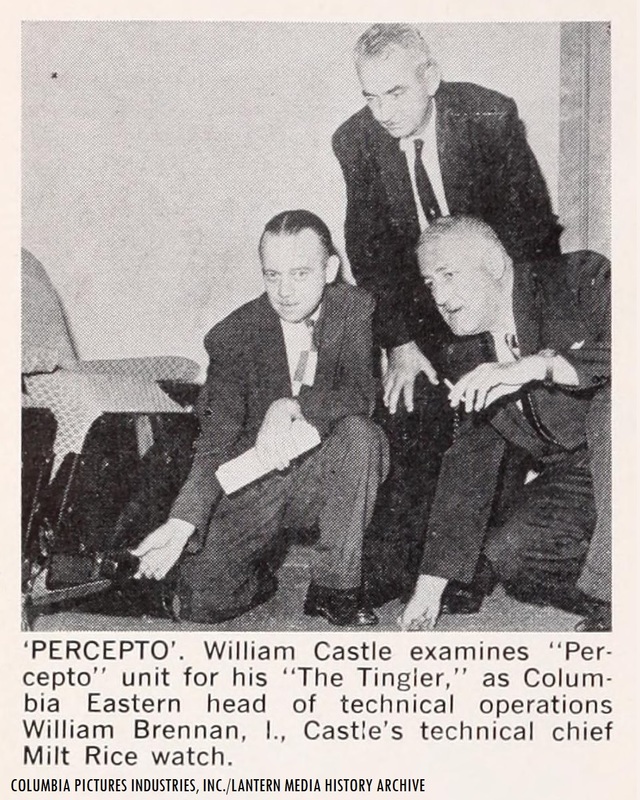 Castle called his gimmick “Percepto.” According to a 1959 Film Bulletin article on Castle’s “Percepto” installation with technicians Milt Rice and William Brennan, the wired motors were battery-powered and were installed in every tenth theater seat (as part of the official specifications for cinemas who wanted to screen Castle’s Columbia thriller). For certain theatrical markets that screened “The Tingler,” Castle and Columbia publicity also hired a mock audience member to faint on command, along with mock doctors to carry out the “fainted” patron; according to Sean Axmaker’s article on “The Tingler” (1959) for Turner Classic Movies. 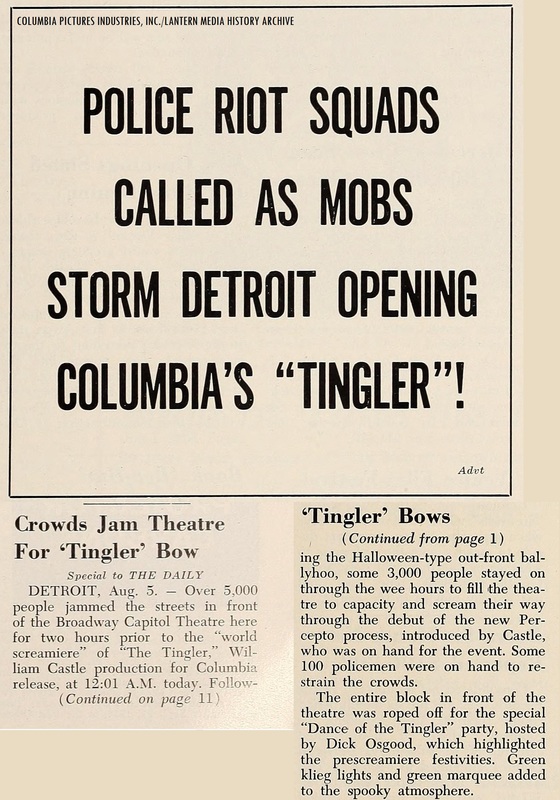 According to additional details from the 1959 Film Bulletin article, Castle also expressed additional “gimmick” techniques for the Columbia theatrical release of “The Tingler” (in addition to the “Percepto” formula); including mock insurance policies, “Dance of the Tingler” spooky dance parties for theatergoers and “Tingler” charms to deter audience members from the spook scenes in the film. From Columbia Pictures‘ 1959 premiere of William Castle‘s “The Tingler” at the Broadway Capitol Theatre (now known as the Detroit Opera House). 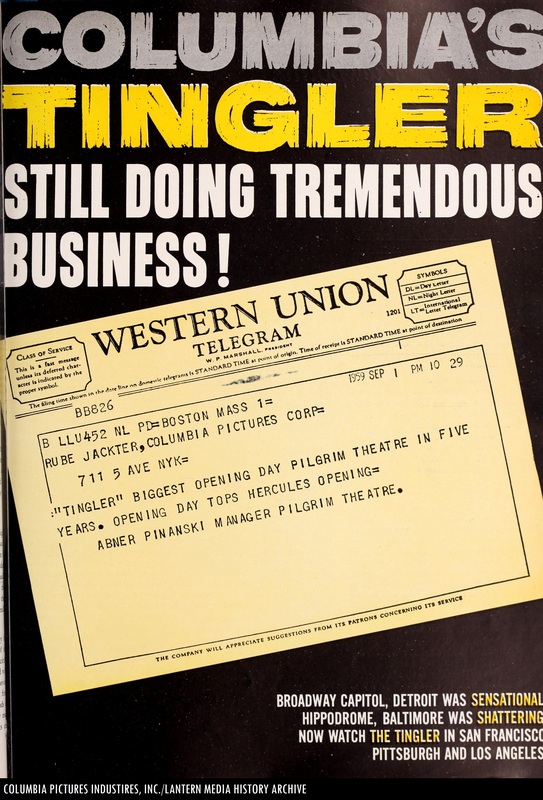 According to a 1959 issue of Film Bulletin magazine, the world premiere or “screamiere” of William Castle’s “The Tingler” (1959) was held at the Broadway Capitol Theatre in Detroit, Michigan. Today, the former Capitol/Broadway Capitol Theatre operates as the Detroit Opera House. Be sure to watch or record Svengoolie’s coast-to-coast big broadcast premiere of William Castle’s “The Tingler” (1959), this Sat. on Me-TV! 1959 Columbia Pictures exhibitors’ advertisement for the success of William Castle‘s “The Tingler,” including a mention of Baltimore’s famed Hippodrome Theatre as one of the key exhibition spots for the Castle-Columbia shocker/thriller..
Svengoolie (portrayed by Rich Koz), Kerwyn and all fellow coast-to-coast SvenPals are excited for the upcoming Sat. Me-TV big broadcast of William Castle‘s “The Tingler” (1959)! With Price, Evelyn, Hickman, Cutts, Lincoln and Coolidge; you will not want to miss out on Svengoolie’s big coast-to-coast broadcast premiere of William Castle’s “The Tingler” (1959), this Sat. on Me-TV. Don’t miss out on frights and fun with Sven’s extended fun facts, Doug Graves’ musical intermission and Kerwyn’s mail call segment! A perfect treat for all fellow SvenPals and fellow aficionados of William Castle’s legendary gimmick masterpieces from coast-to-coast! You will not be disappointed! Highly recommended! Live-tweet with all fellow #Svengoolie SvenPals from coast-to-coast (via Twitter) during big Me-TV broadcast premiere of William Castle’s “The Tingler” (1959)! (The author of “Silver Screen Reflections” already cast his vote during early voting near the end of Oct. 2018): We hope all fellow super Svengoolie SvenPals did their civic duty by casting their vote during the 2018 mid-term election! Kudos to all fellow super SvenPals and fellow subscribers/readers of “Silver Screen Reflections” who voted in early voting, through absentee voting or in today’s Nov. 6. election! (A belated cameo mention): Fellow super SvenPal Jennifer M. and her family’s drawing was showcased during Svengoolie and Kerwyn’s “mail call” segment during Sven’s Oct. 6 Me-TV big broadcast premiere of the Bela Lugosi/Lew Landers/Columbia vampire thriller, “The Return of the Vampire” (1943) on Me-TV! Numerous fellow super SvenPals found the footage recently (from recordings of Sven’s Oct. 6 broadcast), kudos to fellow Super SvenPals Statler & Waldorf and David Fuentes for finding a copy footage for Jennifer! Belated congratulations on your family’s drawing being shown on Svengoolie’s showcase, Jennifer! Kudos, peace and “Hi-Keeba” to you (and to Statler/Waldorf & David for retrieving a copy of the footage)! All of us fellow SvenPals are jumping for joy! -C.H. A fellow super SvenPal and a connection to a silver screen legend! Fellow super SvenPal Jamie Lee recently wrote a review about David Gordon Green’s latest 2018 rendition of John Carpenter’s 1978 cult horror masterpiece with Jamie Lee Curtis, “Halloween!” Fellow super SvenPal Jamie Lee recently wrote her review about Green’s “Halloween” on fellow super SvenPal David Fuentes’ blog site, “Terror From Beyond the Dave!” Be sure to read about fellow super SvenPal Jamie Lee’s connection to another recent Jamie Lee Curtis feature that was filmed this year! Congratulations and kudos to the two Jamies and to David from all of us fellow super SvenPals and cult/classic horror film aficionados from coast-to-coast! The entire league of fellow SvenPals are jumping for joy! Peace and “Hi-Keeba!” -C.H. (Updated 11/9: Jamie Lee’s Sat. morning WNUR/Northwestern University Radio program, “Jammin with Jamie” will be on hiatus for a couple of weeks until late Nov.): And fellow super SvenPal Jamie Lee will be officially broadcasting her post-Halloween jam session of extra Halloween songs on “Jammin’ With Jamie,” this upcoming Sat. morning, Nov. 10 at 6 a.m. Central/7 a.m. Eastern; live on the airlanes of Northwestern University Radio/WNUR-FM 89.3 (Chicago/Berwyn) and WNUR.org (also simulcasting from coast-to-coast and around the world on the TuneIn app)! Jamie’s jam session was recently postponed due to WNUR’s Nov. 3 “Sports-A-Thon” sports programming pledge drive. Again, if you have a favorite Halloween song from film, theater/stage and TV; be sure to send your request to Jamie’s official Twitter feed or Jamie’s official site before this Sat.! 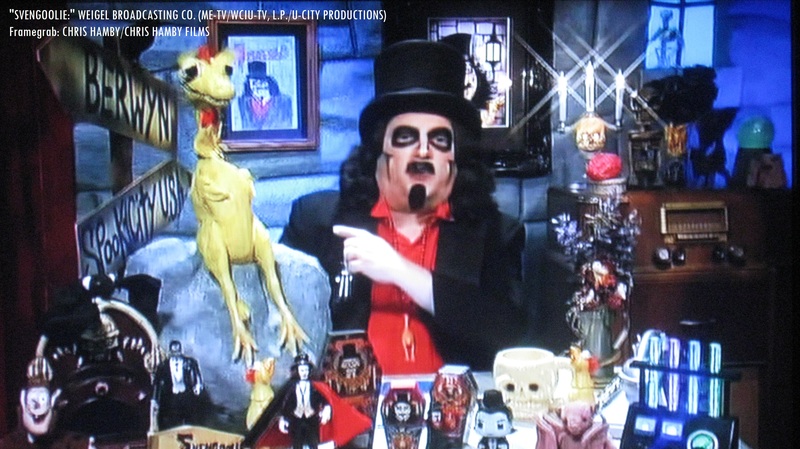 All of us fellow coast-to-coast Svengoolie SvenPals, classic/cult horror/monster film aficionados and jammers are looking forward to the official broadcast of extra Halloween songs this Sat., Jamie! Again, Peace, kudos and “Hi-Keeba” from all of us! And again, be sure to spread the word/give generously to help one of Jamie’s PM&L Theatre ensemble friends’ additional medical treatments (through GoFundMe) by helping to offset the astronomical costs! –C.H. 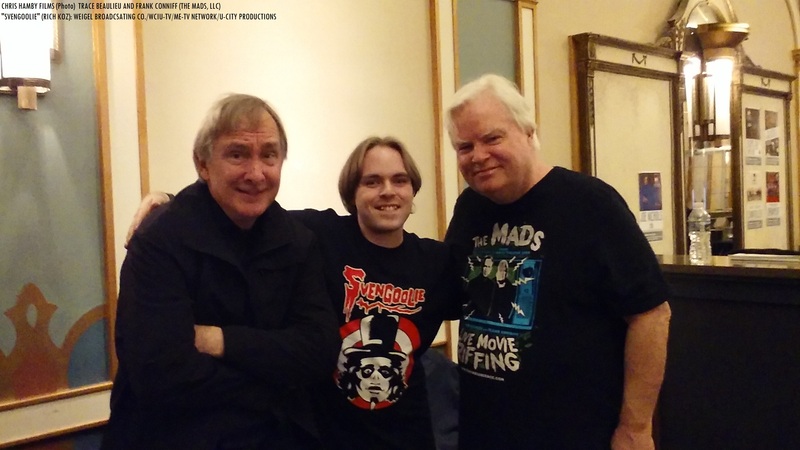 Flashback “Silver Screen Reflections” posts on Trace Beaulieu and Frank Conniff (of MST3K fame)’s “Mads!” live movie riffing showcases of William Castle’s “The Tingler” (from Nov. 2017/Frederick/Weinberg Center and March 2018/Ashburn/Alamo Drafthouse)! Many fellow super SvenPals and MSTies have seen Trace & Frank’s live riffing rendition of Castle’s classic Columbia thriller! And speaking of Trace, today is his birthday! Happy Birthday, Trace! -C.H. William Castle’s “The Tingler” (1959) is also available on Blu-Ray disc from Shout! Factory and their horror/thriller imprint, “Scream Factory” (by arrangement with Columbia Pictures Industries, Inc./Sony Pictures Entertainment/Sony Pictures Home Entertainment). The film is also available on DVD from Sony and is also available on participating digital streaming providers (via Sony). Questions/comments about “Svengoolie” and/or William Castle’s “The Tingler” (1959)? Drop a line at the comments section!